Holiday decorations. Over 700 trees are trimmed including a 60-foot-tall tree in Town Square decorated with more than 2,000 ornaments and 4,800 lights. New this year is a cartoon-style Christmas tree in front of Mickey’s Toontown City Hall among other holiday décor. The Magic, The Memories, and You! A new segment was added featuring favorite holiday tunes and images of resort guests celebrating their holiday visits, during which the façade of “it’s a small world” Holiday is frozen in ice, decorated with wreaths and candy canes, wrapped in Christmas paper, and even turned into a giant snow globe. World of Color. Lanny and Wayne of “Prep & Landing,” make guest appearances in a new holiday prelude sequence. Sleeping Beauty’s Winter Castle. At night, the castle is transformed into a winter wonderland employing more than 200,000 points of light. A Christmas Fantasy Parade. 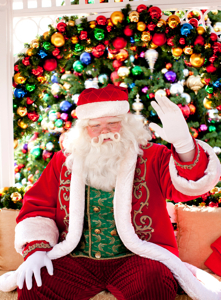 A holiday tradition in Disneyland, watch Disney characters celebrate the magic of the season, wrapping gifts, baking holiday treats and preparing for the arrival of Santa Claus, who shouts a jolly greeting to spectators along the parade route. “It’s a Small World” Holiday. With more than 300,000 glittering lights on its façade, special effects inside the attraction were added including pine tree and peppermint scents in the European scenes and 75 gallons of bubble juice to make bubbles throughout the season in the South Seas scene. 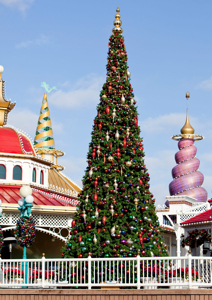 Nearly 150 giant candles decorate the Christmas Tree in the European scene, and 7,500 lights sparkle on the Snow Flake Tree in the “it’s a small world” Holiday finale. New this year in the finale is a 14-foot sparkling snowman. Haunted Mansion Holiday. A madcap celebration as the traditions of Halloween and Christmas collide. The ghoulish but well-meaning Jack Skellington from the film “Tim Burton’s The Nightmare Before Christmas” has come to Haunted Mansion to transform it with his skewed vision of the holidays. Holiday treats. Watch the candy makers on Main Street, U.S.A. at the Candy Palace practice the lost art of candy cane making. Holiday-themed Mickey Mouse ears, ornaments, jewelry and dolls. Available exclusively at Resort theme parks and the Downtown Disney district. Santa’s Reindeer Round-up. In Frontierland, kids and their families can chat with St. Nick and see real reindeer grazing in a corral. Believe… in Holiday Magic fireworks show. A journey of sights and sounds of the season ending with a touching rendition of “White Christmas,” along with a climactic snowfall swirling down on Main Street, U.S.A., “It’s a Small World” Mall and New Orleans Square. Three Kings Day. All new at Disneyland Resort, the Holiday season will be extended to celebrate Three Kings Day, known as Día de Reyes. From Jan. 6-8, 2012, look for special décor and entertainment in Frontierland that showcases western and Mexican heritage, along with food themed to this holiday and children’s activities. Book a guided holiday tour that provides entry into “It’s a Small World” Holiday and Haunted Mansion Holiday, reserved seating for the Disneyland “A Christmas Fantasy” parade, a keepsake remembrance and entertaining information about the history behind Disneyland holiday traditions. For information and reservations visit Disneyland City Hall or call (714) 781-4565. Disclosure: Disneyland hosted us for the purposes of writing this review. No other compensation was provided. All opinions expressed are my own and without influence by Disneyland.